Dedicated to the complete Rottweiler - Show, Work & Companion › Rottweiler Klub of North America Inc. 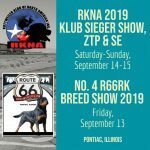 The Mission of RKNA Inc. is to bring together a community of Rottweiler enthusiasts to educate, inform, inspire, and promotes the working Rottweiler. We do this by coming together as a Rottweiler family that encourages and supports new members and Klubs, organizes Sieger shows, creates newsletters, communicates through our online presence and inspires each other to be the best Rottweiler owners and breeders possible. The Rottweiler Klub of North America Inc. (RKNA Inc.) was established as a non-profit organization in 2011 by a handful of people who had vision and passion for the Rottweiler. The executive board of the RKNA worked hard at developing the club with structure, policy, award programs, champion programs, working trials and building membership.